Connor Hakes, an Indiana man, wanted to honor his grandmother by singing at her funeral, but was told by the priest that because of his ‘gay lifestyle’ he wouldn’t be allowed to do so. Father Bob J. Lengerich, who saw a photo of Hakes and his friends at a Gay Pride festival, and told him that he wouldn’t be able to sing at St. Mary’s of the Assumption Catholic Church in Decatur because he was openly advocating for gay rights. I can no longer sing at my Grandma’s funeral, because I attended a gay pride rally and a picture was posted publicly (years ago). The priest’s reasoning is by attending such event, I am opposing the Catholic Church’s fundamental marriage belief. 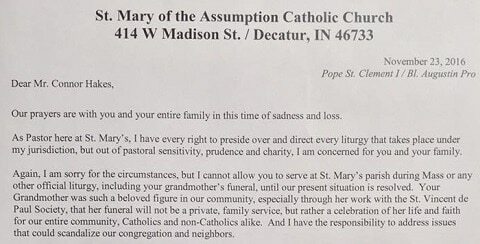 Both my Grandma and Grandpa would be disgusted by their parish. Their compassion and empathy was abundant, no matter who you were. They saw beyond race, religion, sexuality, and social class. They loved everyone. That is what is means to be a Christian. That is what it means to be Catholic. Please SHARE!